For other people named John Murphy, see John Murphy (disambiguation). 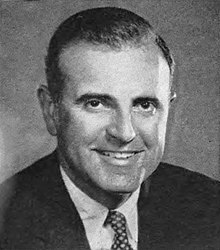 John Michael Murphy (August 3, 1926 – May 25, 2015) was a Democratic member of the U.S. House of Representatives from New York's 16th (1963–1973) and 17th (1973–1981) districts. He was convicted of taking bribes in the 1980 Abscam scandal. Murphy was born in Staten Island, New York City, New York and attended La Salle Military Academy, Amherst College, and the United States Military Academy at West Point. He served in the U.S. Army from August 1944 to July 1956, first as an enlisted man before receiving his commission after four years at West Point. During his military service he received the Distinguished Service Cross and the Bronze Star, and was discharged as a captain. During his time in Congress he chaired committees dealing with maritime and oceanic matters. He was a life long friend of Anastasio Somoza since their days as students at West Point; while in office, Murphy opposed the Carter administrations efforts to remove Somoza. His son, Mark Murphy, is a real-estate developer who worked as an aide to Bill de Blasio during his tenure as New York City Public Advocate. On January 19, 2012, Mark Murphy announced he would seek election to the Congressional seat his father once held. On November 6, Murphy lost the election to incumbent Republican Michael Grimm, 46.2% – 52.8%. Murphy died the age of 88 on May 25, 2015, at Richmond University Medical Center in Staten Island, NY of complications from a heart attack. ^ a b c d United States Congress. "John M. Murphy (id: M001098)". Biographical Directory of the United States Congress. ^ Hicks, Jonathan P. (November 5, 1997). "Republican Wins U.S. House Seat Left by Molinari". The New York Times. Retrieved 2009-12-21. The stakes were perhaps higher for the Republicans, who had represented the district since 1981, after Guy V. Molinari defeated John M. Murphy, a nine-term incumbent whose campaign was hobbled by his indictment in the Abscam bribery scandal. ^ a b c Fried, Joseph P. (May 26, 2015). "John Murphy, Staten Island Congressman Convicted in Abscam Sting, Dies at 88". New York Times. Retrieved May 26, 2015. ^ Robert Grady (March 12, 1979). "Nicaragua: La Lucha Continua". Harvard Crimson. Retrieved July 9, 2015. ^ "New York – Election 2012 – NYTimes.com". nytimes.com. Retrieved 12 April 2013.